Last Thanksgiving Day – after the turkey and the stuffing and the rolls and the mashed potatoes and the damn yams – my family took a walk. The air was chill, the sky cloudy, and the landscape the same as it had been most of my life. 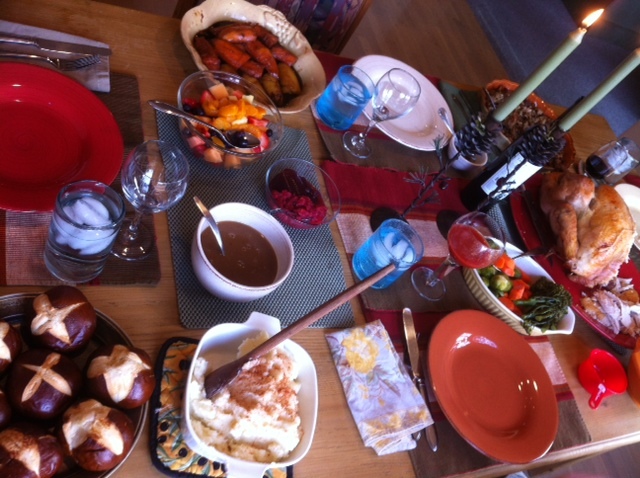 But so much had happened – moving and returning from Maui, going to graduate school, traveling to the Middle East – but the day felt the same as all other Thanksgiving Days. “Everything changes, and everything stays the same,” I told my mom as we rounded the corner to the house. “Yup, that’s the secret,” she replied. It’s a dichotomy – a concept that has been rattling around in my mind the last six months. You can’t have one without the other – yin and yang, perfect and imperfect, full and empty – but they are actually the same thing. It is the same circle. 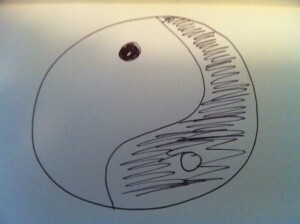 It takes two opposite ideas to make it whole, using resistance and the law of attraction to keep it together. Let’s look at the example of Hope and Fear. If we go far enough to the extreme edge of fear, it loops around into hope. I fear tornadoes so much, I hope I never see one (or, I hope that I do see one). It is the same circle, but our emotions and degree of opposites change proportionately to keep the circle whole. The change depends on multiple variables – the moment, the day, the feeling, the thought etc. 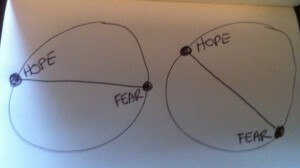 But, what if instead of the straight line of Hope and Fear moving, it’s the whole circle that actually moves. Meaning the line in the circle remains stationary, but the circle spins around – like it sits on a base of wheels. Like Bubbles and the shopping cart in Trailer Park Boys (Warning: this link is very uncensored with many bad words – in both Canada and America), and the clip has nothing and everything to do with dichotomies. All we need is already in us. The circle stays the same, it just spins around depending on our chosen perspective. Because everything changes, and everything stays the same. This entry was posted in Family, Home, Transition by Kimberly Bowker. Bookmark the permalink.